Don’t know whether to buy a new WinTel PC or try a Mac? Why not try both? I have a long history with Apple and Mac computers, ever since I was a kid. 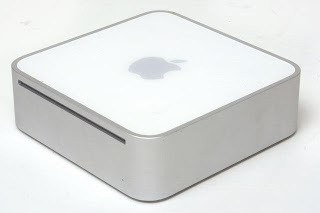 As an adult, I waited patiently to get one and now I finally have a Mac Mini, running a dual-core Intel CPU. The nice thing about it is that you can enjoy both worlds. Using a program from Apple called Bootcamp you can install as many operating systems on your Mac as you'd like. I currently have Mac OS X 1.4.9 and Windows XP SP2. I considered adding Linux, but didn't see the point, as Mac OS X has a UNIX kernel. And finally, installed a control panel, in both OSs, allowing easy switching between them. To share disk space between the 2 OSs, it has to be formatted to FAT32, as Mac OS X doesn't allow writing to an NTFS partition, and XP can only read HFS with the aid of a third party software.